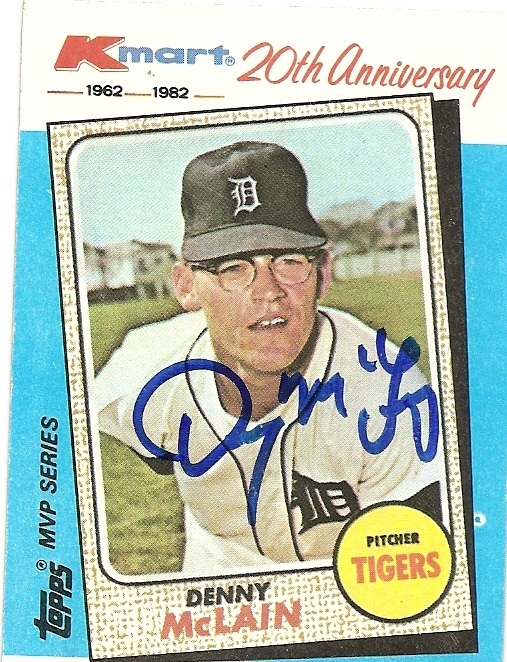 Okay, I never saw Denny McLain pitch in person. As a matter of fact, his career ended in 1972 when I was only five years old. That being, said, even though he did not have a very long career, he accomplished something that very few players have done in their careers. As a matter of fact, he is the last person of the thirteen who did it in the 20th century. Of course, 1968 is known as “The Year of the Pitcher” in baseball, when pitchers basically dominated both the National and American Leagues, McLain included. He wound up winning 31 games that season as the Tigers made their way to the World Series and the eventual championship over the Cardinals. That wasn’t his only good season. Even though baseball changed the height of the pitcher’s mound and shrunk the strike zone in 1969, McLain still won 24 games and won another Cy Young Award, to go along with his award in 1968 (he also won American League Most Valuable Player that year). No one ever doubted his talent. His first game in the minor leagues for the White Sox in 1962 he threw a no-hitter and struck out 16 batters. He won 20 games in 1966, 17 games in 1967, 31 in 1968, and 24 in 1969. If his 131 career wins, 92 of them came in that four-year span. Unfortunately for McLain, his personal life led to his undoing. He was always seen as something of a troublemaker and never failed to rouse the ire of teammates, management, fans and baseball itself. He spoke his mind, which often got him into trouble. He was long rumored to have served up a home run ball to Mickey Mantle so Mantle could take over 3rd place on the home run list since he was always a fan of Mantle’s. Besides being outspoken, he seemed to find trouble. He was a known gambler and found himself involved in a bookmaking operation, which led to a suspension. Subsequent suspensions followed him through the 1970 season for other infractions, including carrying a gun onto a flight. The Tigers eventually had enough and traded him to the Senators in October, 1970 in a package deal that also sent Elliott Maddox to the Senators. In return, the Tigers got a package including Joe Coleman, Aurelio Rodriguez and Ed Brinkman. Brinkman and Rodriguez were Gold Glove infielders and Coleman had a good career with the Tigers, so it was quite a steal. McLain clashed with Senators’ manager Ted Williams, lost 22 games, hurt his arm, ticked off management and got himself traded to the Oakland A’s, who shortly after traded him to the Braves for Orlando Cepeda. He finished 1972 with the Braves, they released him in spring training of 1973, and he was out of baseball at 29. Granted, McLain became infamous for all of his legal troubles after his baseball career and has spent various stints in prison for things like racketeering and embezzlement. He has also done various sports radio and talk shows and a column for a sports magazine and still resides in Michigan. It’s sad his career didn’t turn out better than it had as he, like so many others, had the potential to be a Hall of Fame pitcher. He won 131 games and still had all the troubles he had; if he had managed to stay healthy and out of trouble, who knows how good he could have been. I tried for years to get his autograph but often got no response until I got this card back in 2011, nearly 3 years after I had sent it. it’s from K-mart card collection I had many years ago, and it was nice of him to sign it. Next time up, we’ll go back to another former Met. What can I do or you? I look forward to hearing from you. Wow, thank you for finding my blog and my article. I would love the chance to just ask you a few questions sometime about your career. Thanks for stopping by!